I think this is the first time I’ve set eyes on a four hundred and fifty year old vine, and pretty substantial it is too. 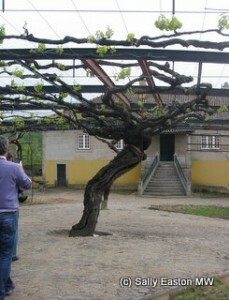 It’s owned by producers Solar do Louredo in Portugal’s Vinho Verde region. It’s a traditional black grape variety, we’re told, no surprise there really, – doçal, pronounced ‘do-sarl’, meaning sweet. The small amount of fruit it still produces goes into one of their blends.